A CEO who had begun to practice his own form of “management-by-walking-around” learned from his employees that the company inhibited innovation by subjecting every new idea to more than 275 separate checks and sign-offs. He promptly appointed a task force to look at this situation, and it eliminated 200 of the obstacles. The result was a higher innovation rate. Finally, a success story in one of these posts! This may sound like a success story, but, is it? It certainly is; the CEO uncovers a flawed process and, with his team, drives a dramatic improvement. Chris Argyris would call the CEO’s work above a great example of “single-loop learning;” addressing an issue but leaving the more fundamental problem unexamined and unsolved. A double-loop approach would have the CEO asking some tougher questions; questions about — yes, you guessed it — the company culture. Best: “What beliefs do my leaders hold, and what behaviors do they exhibit, that lead them to support and embed a process that requires 275 sign-offs and approvals? Phenomenal! : “What assumptions am I making and what biases do I hold that are manifesting themselves in the culture of this organization, leading to an approval process with 275 signoffs and associates that are reticent to challenge that process? 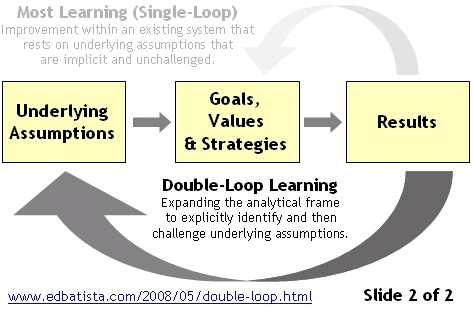 Double-loop learning asks questions to understand what’s underneath the visible, presenting problem. It seeks the fundamental cause and effect. I feel compelled to help others (and myself) break out of the single loop! Interestingly, though, most managers are thrilled when they successfully walk the single loop. In fact, don’t most organizations reward managers that are effective in walking the single loop? They are always solving problems, right? So why incessantly ask questions that seem to deny the good work that they’ve just done and that everybody else recognizes? Besides; who has time? I mean, there’s so many other pressing problems to solve! Management by walking around… in a double loop. Make a difference.